The Ariana Institute’s Techniques in the Spa World Manual is part of a series of massage manuals that are designed to help deepen the knowledge of current massage therapists and introduce new massage therapists to the world of massage and bodywork. This manual incorporates detailed protocols, photos, links to online videos, marketing strategies, personal stories, and resources to encourage a comprehensive understanding of spa techniques and modalities beneficial for your massage practice. Here’s a personal story about hot and cold stone massage featured in the Techniques in the Spa World Manual. My first experience with hot stones was in the mid 90s when I worked as a massage therapist at Barton Creek Resort and Country Club in Austin, Texas. The resort offered hot stone therapy as one of its treatments. At first I thought it was just another passing fad, so I resisted immersing myself in that world. I was wrong; hot stone therapy has turned out to be one of the most popular modalities offered in the massage profession today. During my time at Barton Creek, I could see that this was a viable and effective modality that was here to stay, so I began researching hot stone classes and I inquired with my colleagues who were offering hot stone therapy. One of my dear friends who worked at the Lake Austin Spa Resort offered to give me my first hot stone session. It was unforgettable. The kinesthetic experience of the gentle pressure from the smooth hot stones on my body was transforming. I am grateful that my massage therapist was an experienced and talented hot stone practitioner who incorporated a smooth, rhythmic flow with a knowing intelligence regarding pressure, depth, and stone placement. I will be forever thankful to her for opening up the doors to this incredible modality. Once I experienced a session, I was definitely hooked on stone therapy. Soon after I registered for a hot and cold stone class offered by LaStone Therapy. Participating in that class was an amazing experience. Our instructor was intelligent and knowledgeable and she obviously loved the stones as much as I did. We saw demonstrations, heard testimonials, and exchanged several sessions with our colleagues over the course of the classroom experience. I purchased my first set of hot and cold stones from them that very week! I was off to a new and unique adventure. After I offered practice sessions and felt comfortable with gauging the temperature and pressure of the stone work, I proceeded to refine my timing so I could offer a session professionally. I looked at the ritual of offering hot and cold stone therapy as a dance and a challenge. Happily, not too much time passed before I had the temperature, timing, rhythm, pressure, and cleaning down pat. Shortly following this process, I began offering hot stone therapy at Barton Creek Resort, as well as offering hot and cold stone therapy in my private practice. It was a remarkable turning point in my massage therapy career. I felt happy to have mastered a modality that I loved and enjoyed giving as well as receiving. The soothing, nurturing warmth of the basalt stones coupled with the brisk coolness of the marble stones creates a delightful contrast that, among other things, enchanted me from the very beginning about this modality. I love the unique and unforgettable tactile sensation in a stone session that affects both the giver and the receiver. When I left Barton Creek Resort, I continued offering hot and cold stone in my private practice, and subsequently at The Crossing Wellness Spa and the Hyatt Lost Pines’ Spa Django. Taking the time and initiative to learn a new modality served me well in terms of personal pride and also in terms of increasing my economic prosperity. Further on in my career, offering continuing education classes in hot and cold stone therapy through The Ariana Institute became an additional milestone for me. I went to a local landscaping company and sorted through their basalt stones, one-by-one, to find the perfect stone sets for my students. I ordered specially sculpted marble stones from La Polar Stones for use in class. I found the most appropriate and affordable warmers and nets for the toe stones. I figured out how many warmers I could have in a classroom without blowing a fuse. I created a comprehensive course notebook. I also designed and developed a video for my students to refer to outside of class and for my online students to use in their remote studies. The hands-on classes went smoothly and were very well received and the online hot and cold stone class is one of The Ariana Institute’s most popular classes. To read the foreword of the Techniques in the Spa World Manual, visit https://www.arianainstitute.com/blog/the-ariana-institute-proudly-presents-techniques-in-the-spa-world-second-edition/. The Ariana Institute’s video introduction to the Aromatherapy, Ayurvedic Massage, Couples Massage, Hot and Cold Stone Massage, as well as other Spa Technique CE courses can be accessed on the Ariana Institute’s YouTube Channel at www.youtube.com/user/ArianaInstitute. To order your copies of the Ariana Institute’s Techniques in the Spa World Manual, visit www.amazon.com/author/arianavincent. The Ariana Institute’s Marketing and Practice Building for Massage Therapists Manual is part of a series of massage manuals that are designed to help deepen the knowledge of current massage therapists and introduce new massage therapists to the world of massage and bodywork. This manual incorporates strategies, personal stories, and suggestions to help deepen the understanding of marketing and practice building for current massage therapists and introduce new, upcoming massage therapists to innovative and creative ways to create a successful, thriving massage practice. Here’s a personal story about marketing and practice building featured in the Marketing and Practice Building for Massage Therapists Manual. When I first became a massage therapist in the early 80s, it didn’t seem to occur to legislative bodies to have licensing for massage therapists, therefore, we had few formal massage schools and only rarely were marketing classes offered to help guide us on our way. The internet was not available to the public outside of academic environments, so we had limited connection with other massage therapists and no way of reaching potential clients electronically through social media or e–mail. Our marketing was primarily limited to word of mouth, referrals, posters on bulletin boards, snail mail, networking, and print ads. My, how times have changed! In 1983, as various states throughout the United States started mandating licensing, and massage schools started opening on a broader scale, I built on the initial core curriculum training I had in Austin by participating in additional massage technique training with the Texas Massage Institute. Utilizing the knowledge I gained in these classes, I marketed myself within the framework of the medical environment where I worked. I also marketed my private practice by networking, attending conferences, and building goodwill in the community. Additionally, I created business cards and flyers to distribute during these opportunities. I continued participating in advanced continuing education courses in order to deepen my knowledge base and increase my skill set. In 1999, as the state licensing requirements further increased, I attended an additional massage therapy training program where I studied with the most incredible marketing teacher, Irene Watson. She and I connected deeply and stayed friends after I graduated from the program. A few years later when she decided to retire from teaching and retool her career in another direction, she gave me boxes of files filled with her teaching materials. I had been teaching massage for approximately two years and being gifted with this treasure trove of instructional material was a turning point in deepening and enriching the courses that I offered. I felt encouraged to begin an in–depth exploration of teaching additional modalities. Her affirmation of my teaching abilities was inspiring on many levels. I supplemented my own marketing, teaching, and practice building research with the materials given to me by Irene. I read books, listened to tapes and CDs, watched videos, and attended marketing workshops and classes. This information, coupled with my own years of experience in the massage therapy profession, helped me evolve as an educator. The next step in my journey as a massage therapy instructor was to extend the use of my knowledge by developing curriculum and teaching courses specifically related to marketing and practice building. The first marketing class that I taught was for the Texas Association of Massage Therapists in Austin. I researched the material carefully, utilized information from my marketing teacher as a point of departure for my own ideas, and thought about what did and didn’t work for me as I marketed my practice. From there, I created a comprehensive course notebook. It was a golden moment for me – my first class! The information was well received and I felt very connected to the students. Many of us stay in touch throughout the years. We have referred clients back and forth, and have supported one another in our marketing efforts. Some of the people who attended my initial class have taken subsequent classes from me over the last 16 years, and several have become educators in the massage community. I could see that participation in this class encouraged my students to use their time and energy wisely and market in ways that best suited their personalities and lifestyles. Like my time teaching at the Texas Association of Massage gathering, being a part of organizations has been a beneficial experience. I feel very supported through my involvement with The World Massage Festival, the National Certification Board for Therapeutic Massage and Bodywork, the Alliance for Massage Therapy Educators, the Associated Bodywork and Massage Professionals, and the American Massage Therapy Association. Participating in these organizations has opened many doors for me locally and nationally that would have otherwise remained closed. As name recognition for the Ariana Institute for Wellness Education increases through these networks, more students are drawn to participate in our online and hands–on continuing education classes. As I reflect on my marketing and practice building journey, I can see that it is important to use the internet as an accessible tool to the public, participate in organizational activities, and take marketing and practice building classes to keep abreast of new and relevant ideas in the marketing community. Even though I have been in the massage profession for many years, these are concepts that I continue to practice and promote as times continue to change. Teaching marketing and practice building has had a profound influence on my life; best stated by Pericles, “What you leave behind is not what is engraved in stone monuments, but what is woven into the lives of others.” That Pericles quote reflects the importance of being mindful of how our lives can affect those around us in a positive and uplifting manner as we build our practices ethically and with integrity. 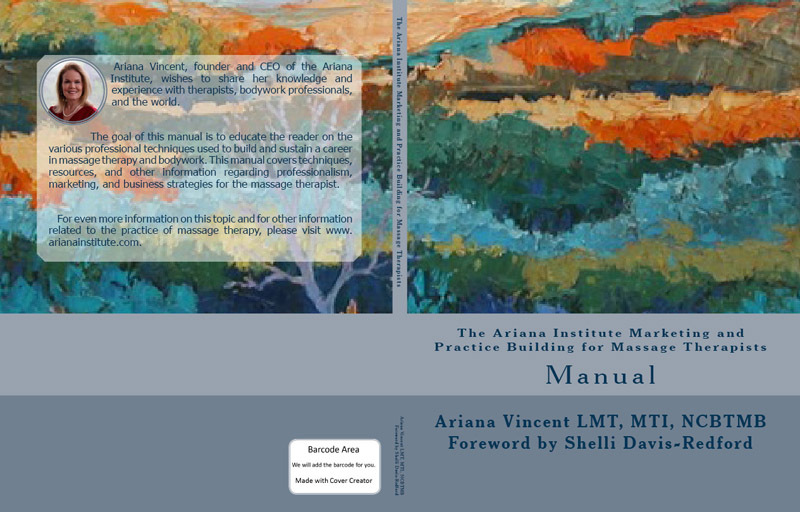 To read the foreword of the Marketing and Practice Building for Massage Therapists Manual, visit https://www.arianainstitute.com/blog/the-ariana-institutes-marketing-and-practice-building-for-massage-therapists-manual-and-ce-courses/. The Ariana Institute’s video introduction to Marketing and Practice Building Massage CE courses can be accessed on the Ariana Institute’s YouTube Channel at www.youtube.com/user/ArianaInstitute. To order your copies of the Ariana Institute’s Marketing and Practice Building for Massage Therapists Manual, visit www.amazon.com/author/arianavincent. This manual incorporates detailed protocols, photos, links to online videos, marketing strategies, personal stories, and resources to encourage a comprehensive understanding of mind-body therapy modalities beneficial for your massage practice. Here’s a personal story about PTSD and trauma featured in the Mind-Body Therapy Manual. My most significant influencers in this area of specialization include Rick Levinson, LCSW, and Peter A. Levine, Ph.D. It is through the knowledge I gained from these individuals over the years that I deepened my understanding of the importance of coupling somatic modalities with qualified psychological guidance when focusing on the reduction of the symptoms of trauma and the management of PTSD. Several years ago, there were a series of wildfires in Central Texas that devastated the landscape and caused several of my clients to lose their property and everything they owned. One of my clients lost her beautiful two–story home, a cottage on her land where her son lived and her pottery studio. Another client lost her home, her pottery studio, her yoga studio and her massage studio. They each grieved the loss in different ways. Fortunately, they both had excellent support networks to help them through those troubled times. I am grateful to have been a part of their resource team. I was honored to be able to offer massage therapy sessions to these two women after the loss of their homes, businesses, and landscapes. I appreciated being able to make a meaningful difference in their lives at a time of regrouping, centering, and restoring balance. Massage, whatever the modality, is typically harmonizing and balancing, and it helps to draw individuals back to their core. This seems to be especially true for my two clients who experienced a sudden and unexpected whirlwind of energy around their very peaceful, creative and serene country lives. When they came for their massage sessions, both women expressed their gratitude for being in my treatment room, which they called a “sanctuary” and an “oasis” in their otherwise topsy–turvy lives. Her letter is a testimony to the resilient nature of the human spirit. When I received the letter, I was even more grateful, in a very humble way, to have been a part of her process of recovery by offering massage therapy to her during a time when she was restoring her life to balance. I am grateful for the knowledge I gained while learning to offer massage for survivors of PTSD and trauma, especially as I was designing the Ariana Institute’s Soothing PTSD and Trauma course. I developed the Soothing PTSD and Trauma course to increase massage therapists’ knowledge regarding working compassionately and effectively with the effects of trauma in their practices. Topics addressed in the course include finding a personal comfort zone, self care, maintaining appropriate boundaries, establishing trust, centering and grounding skills, effective communication skills, and honoring your scope of practice. Diving into the world of PTSD and trauma from a therapeutic perspective has enriched my life and has provided yet another avenue for being of service to the world as a professional massage therapist and massage therapy instructor. To those of you who read the PTSD and Trauma section of the Ariana Institute’s Mind-Body Manual, I honor you, am grateful for your interest in soothing trauma, and I appreciate your presence in the healing community. As Franklin D. Roosevelt so aptly stated, “If civilization is to survive, we must cultivate the science of human relationships – the ability of all peoples, of all kinds, to live together, in the same world at peace.” By offering survivors of PTSD and trauma an environment where they can restore themselves to balance and reconnect with that core of peace within, massage therapists are helping their clients heal and rediscover their true essence. I am grateful for the influence of Rick Levinson and Peter Levine in guiding me along the path of helping people recover from traumatic events and restore their lives and their bodies to homeostasis. 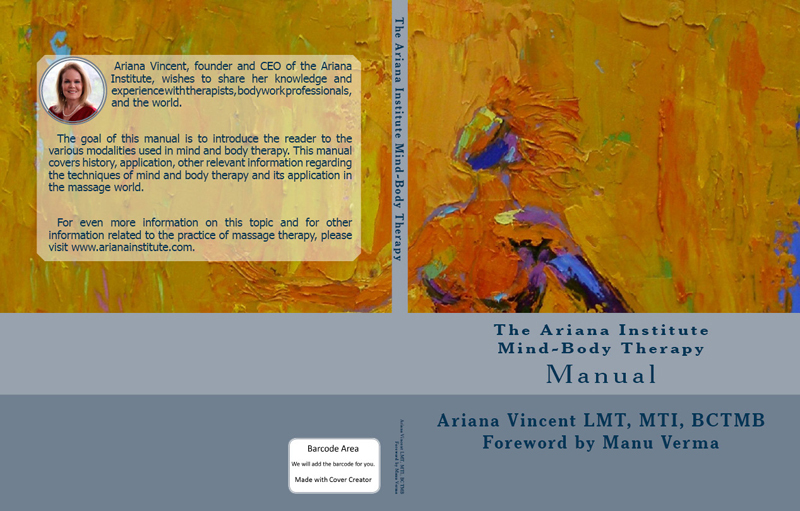 To read the foreword of the Mind-Body Therapy Manual, visit https://www.arianainstitute.com/blog/the-ariana-institutes-mind-body-therapy-manual-and-ce-courses/. The Ariana Institute’s Head, Hand, and Foot Massage Manual is part of a series of massage manuals that are designed to help deepen the knowledge of current massage therapists and introduce new massage therapists to the world of massage and bodywork. This manual incorporates detailed protocols, photos, links to online videos, marketing strategies, personal stories, and resources to encourage a comprehensive understanding of head, hand, and foot massage therapy modalities beneficial for your massage practice. Here’s a personal story about reflexology massage featured in the Head, Hand, and Foot Massage Manual. My first experience with reflexology was at Whole Foods Market where I received an incredible reflexology treatment from Taki, a delightful Japanese woman. From the first moment she touched me, I knew I was going to be transformed. It was clear from the very beginning that she had a deep understanding of reflexology that was far beyond merely a perfunctory technique of lightly touching the feet in certain spots. That is certainly not what reflexology is; it is dynamic and powerful. Taki sat me down in a big reclining chair in a quiet corner of Whole Foods, in downtown Austin. She was like a quick bumblebee rapidly flitting from toe to toe and then working both horizontally and vertically up and down the soles of my feet. She started at the top of my toes, then worked her way down to the base of my toes, then across the pad of my foot and down to the arch of my foot, finally landed on my heel. Taki had the most powerful, intuitive and skilled thumbs I’ve ever encountered. She worked very rapidly and palpated the reflex points energetically with the tip of her thumb. I let my imagination run wild and envisioned myself in a beautiful golden temple in Kyoto, receiving this magnificent reflexology session from a lovely Traditional Chinese Medicine doctor clad in a kimono. It was heaven on earth. This was my first encounter with Traditional Chinese Medicine and I was impressed. As soon as the session was over, I thanked Taki profusely and went on my way back into the sea of people shopping at Whole Foods. My feet felt like they were floating on a cloud. I knew from the moment I received Taki’s treatment that I was determined to learn reflexology techniques, offer them in my private practice and teach reflexology in my continuing education classes at the Ariana Institute. It wasn’t too long after the experience with Taki that I moved to Wimberley and established my massage practice and my continuing education school there. One day I walked into an art gallery and a friend of mine and I talked about my upcoming Hand and Foot continuing education class and she said that her mother, Rosemary, was coming to town and she was a Certified Reflexologist. I immediately asked if I could hire her as a guest instructor for a segment of my upcoming class. Everything fell into place, and Rosemary was in my class demonstrating reflexology techniques for the feet, hands and ears. I absorbed the reflexology information like a sponge and my students were delighted to have the bonus of reflexology in their Hand and Foot Massage class. After the class was over, I took more reflexology classes, watched many videos and then designed the Ariana Institute’s Reflexology Course. I obtained approval from the state as well as from the National Certification Board for Therapeutic Massage and Bodywork in order to offer the class nationally. I’ve found reflexology to be helpful in many ways. It resets the metabolism and is a significant stress reducer. I’ve even had clients who have found relief from headaches after a reflexology treatment. I love the fact that reflexology is a safe, non–invasive and easy–to–administer modality that helps people be more at peace in their own bodies. Feeling like I’m floating on a cloud is one of my ideal states of being and reflexology certainly helps facilitate that euphoria. Ariana Vincent was awarded the 2015 CE Provider of the Year Award by the Alliance for Massage Therapy Education. 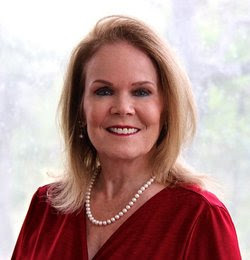 She is the CEO of the Ariana Institute and a Nationally Certified Massage Therapy Instructor whose classes are accepted throughout the United States. Ariana is also a Massage Therapy Hall of Fame Honoree and author of the Ariana Institute’s therapy manual series available on Amazon. 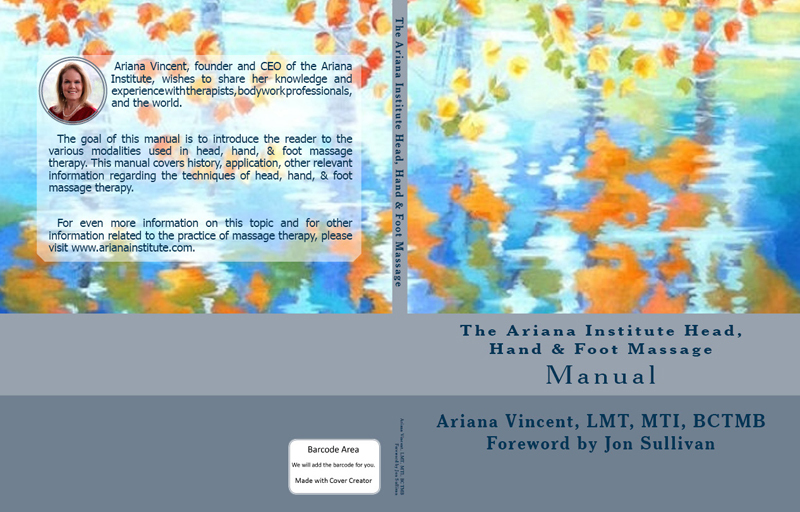 To read the foreword of the Head, Hand, and Foot Massage Manual, visit https://www.arianainstitute.com/the-ariana-institutes-head-hand-and-foot-massage-manual-and-ce-courses-2/. The Ariana Institute’s video introduction to the Reflexology for the Hands, Feet and Ears; Facial and Scalp Massage; and Neck, Hand and Foot Massage CE courses can be accessed on the Ariana Institute’s YouTube Channel at www.youtube.com/user/ArianaInstitute. To order your copies of the Ariana Institute’s Head, Hand, and Foot Massage Manual, visit www.amazon.com/author/arianavincent. The Ariana Institute’s Medical Massage Therapy Manual is part of a series of massage manuals that are designed to help deepen the knowledge of current massage therapists and introduce new massage therapists to the world of massage and bodywork. This manual incorporates detailed protocols, photos, links to online videos, marketing strategies, personal stories, and resources to encourage a comprehensive understanding of medical massage therapy modalities beneficial for your massage practice. Here’s a personal story about HIV/AIDS information for massage therapists featured in the Medical Massage Therapy Manual. HIV and AIDS impact the lives of those around us. The statistics are staggering. According to the World Health Organization (WHO), an estimated 36 million people have died since the first cases were reported in 1981 and 1.6 million people died of HIV/AIDS in 2012. According to WHO, in 2012, an estimated 2.3 million individuals worldwide were newly infected with HIV. How can we help? Massage therapists working with individuals with HIV/AIDS can make a meaningful contribution. Clinical studies have reported that therapeutic massage boosts immune system function in the following ways, (1) reducing anxiety and stress by decreasing the levels of the stress hormone cortisol, (2) increasing white blood cell counts, and (3) activating natural killer cells. Specific to HIV/AIDS symptoms, massage can also decrease pain by relieving muscle spasms, cramps, general body tension, and edema. Additional ways that massage therapists can help individuals with HIV/AIDS include the utilization of modalities that will (1) help relieve respiratory congestion by facilitating the removal of excess phlegm, (2) help prevent or reduce muscular atrophy by improving muscle tone, (3) help increase red blood counts in cases of anemia, (3) stimulate lymph circulation and speeding the elimination of wastes and impurities, (4) assist in the post–surgical breakdown of scar tissue and adhesions, and (5) help decrease depression. My personal experience of working with the HIV/AIDS population has been limited, not through any personal choice of my own; it just seems to be that’s the way my practice has evolved. I have the deepest respect for people like Irene Smith, the director of Everflowing in San Francisco, who has dedicated her life to helping reduce the suffering of individuals with HIV/AIDS. To read more about Irene and the good work she is doing visit www.everflowing.org/irenesmithbio.html. Working compassionately with all spectrums of the population, including those with HIV/AIDS, by utilizing an evidence–based approach, combining skilled touch with compassionate presence to enhance quality of life, can be a profoundly enriching experience for both the giver and the receiver. 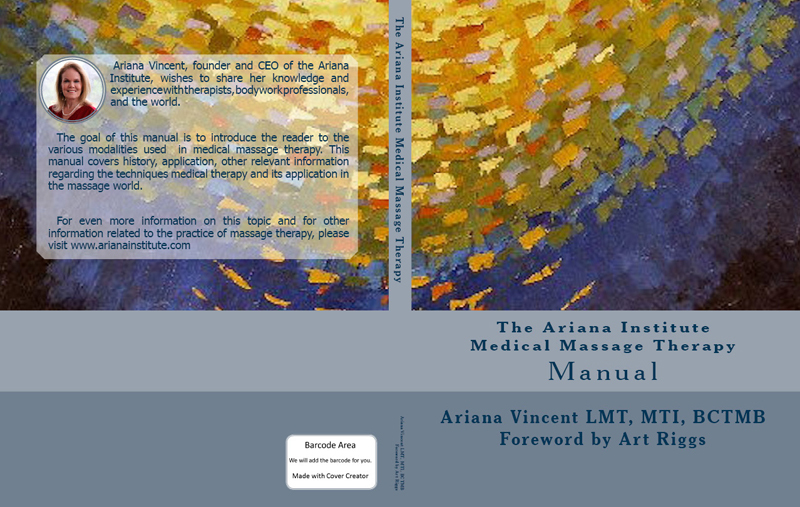 To read the foreword of the Medical Massage Therapy Manual, visit https://www.arianainstitute.com/the-ariana-institutes-medical-massage-therapy-manual-and-ce-courses/. The Ariana Institute’s video introduction to the Headache and Allergy Relief, Lymphatic Massage, HIV/AIDS Information for Massage Therapists, Pain Management, Prenatal Massage, and Geriatric Massage CE courses can be accessed on the Ariana Institute’s YouTube Channel at www.youtube.com/user/ArianaInstitute. To order your copies of the Ariana Institute’s Medical Massage Therapy Manual, visit www.amazon.com/author/arianavincent. Here’s a personal story about lymphatic massage featured in the Medical Massage Therapy Manual. My most memorable lymphatic massage is the first lymphatic massage I offered after my training with Rosario Garza and Mari Paz Gomez at the European Massage Therapy Institute. At the time, I had a successful private massage therapy practice in Austin and I was also employed as a massage therapist at the spa at Barton Creek Resort and Country Club, one of Austin’s premier destination resorts. I met a wonderful colleague at Barton Creek Resort who, for the purposes of anonymity, we will call “Charlene.” She and I had been working together at the resort for about a year when she and her family went on vacation to Morocco, where they were involved in a tragic auto accident. Charlene’s face and scalp were severely injured. Once her wounds began to heal to the point where lymphatic massage was indicated, rather than contraindicated, because of the open wounds, I was able to obtain permission from her physician. I went to her home and offered Manual Lymphatic Drainage (MLD) to her. MLD is a treatment that involves light pressure; like “a leaf on the water.” It activates the musculature of the lymph vessel system by increasing its rate of absorption from the surrounding tissues. It’s a non–invasive way to remove excess fluid and waste products. I utilized the knowledge I gained in my class at the European Massage Therapy Institute to develop a treatment plan. I completed an intake form and assessed Charlene, and then I proceeded to clear the lymphatic channels at the base of her neck. Then I began at the top of Charlene’s head and offered rhythmic, bilaterally symmetrical circles with the pads of my fingertips, medially to laterally, finger–width–by–finger–width from the top of her head to the base of her neck. I checked in with Charlene from time to time to verify that the light MLD pressure was appropriate for her. She agreed that it was and said she felt a sense of relief. After about 45 minutes, we agreed to conclude the session and we both noticed a visible decrease in the swelling in her face around the areas where she had been injured. I felt a wave of gratitude that my first lymphatic massage offered relief from discomfort and reduced the swelling around her wounds. It was a very moving experience for both of us. After successful treatment with Charlene, and many more successes that followed, my confidence in the efficacy of the treatment was set. I made it a point to pursue additional studies in lymphatic massage, make time in my schedule to receive lymphatic massage and take another lymphatic class at a national massage convention in Portland. My experience and extended education have led to me incorporating information on lymphatic massage and protocol in the development of the Ariana Institute’s Head, Neck and Shoulders class. It also prompted me to update the Institute’s Facial Massage class and the Headache and Allergy Relief class with lymphatic massage, as it had proved to be a resourceful modality in many areas. It is rewarding on many levels to discover a modality that is effective and non–invasive; one that helps stimulate the body’s own healing process. I am very grateful that I discovered lymphatic massage so many years ago and continue to use it as a modality. I highly recommend lymphatic massage training and lymphatic massage to help clients recover from injuries and illnesses, as well as part of a total health care plan to maintain and sustain good health. Here’s a personal story about self care for massage therapists featured in the Self Care for the Massage Therapist Manual. My focus on self care has been an ongoing evolution throughout the course of my massage therapy career. I am constantly seeking ways to make work easier for myself by focusing on using good body mechanics, implementing basic self care techniques, and setting and maintaining healthy boundaries. Prior to becoming a full-time educator and author, I worked as a massage therapist in high-volume medical offices and quick-paced spa environments while maintaining my own massage therapy practice. During the lean years, I frequently had two or three jobs just to keep my head above water economically, so I found it of tantamount importance to practice good self care in order to maintain a life in balance especially during times of intensity. The more I learned about effective body mechanics and preventative measures, the better I felt at the end of the day. I could see many highly skilled practitioners leaving the massage profession as they blew their thumbs, injured their wrists or hurt their backs. I am grateful for the ever-evolving focus on self care and good body mechanics in many of the core curriculum and advanced classes for massage therapists. Thanks in great part to the excellent instruction I’ve received in self care and body mechanics, here I am at the other end of my career, in the golden years, still standing upright when called for and able to bend like a willow in the wind when the moment calls for it. I am grateful for the reminders I have in place for drawing myself back to my center. The reminders signal me to nurture myself while nurturing others and to set and maintain healthy boundaries. I don’t know where I’d be today if I didn’t have some tools in my tool belt for returning to a peaceful center through good self care techniques. It took a conscious effort to set up my life in a way that I could work in a healthcare environment without completely depleting myself. Creating the Self Care For Massage Therapists Manual has been a good additional reminder for me on the importance of loving ourselves and caring for ourselves with as much reverence as we care for others. Here’s a personal story about ayurvedic massage featured in the Techniques in the Spa World Manual. My first Ayurvedic experience was in the late 70s at Murietta Hot Springs in Southern California. I attended a workshop taught by Dr. Vasant Lad, executive director of the Ayurvedic Institute; Dr. David Frawley, one of the foremost scholars of Ayurveda and Vedic Science; Donald van Howten, an Ayurvedic practitioner and certified massage therapy instructor; and other stellar members of the Ayurvedic community. During the workshop, we focused on the principles of Ayurvedic healing, components to an Ayurvedic lifestyle, nutrition according to the Ayurvedic principles, and Ayurvedic massage techniques. I was profoundly influenced by the beauty and truth of the Ayurvedic principles. They provide guidelines for bodywork, diet, behavior, ideal life routines; and the proper use of our senses to help each individual maintain a balanced integration of our body, mind, and spirit. The experience of studying with such luminaries in the Ayurvedic community was transforming and set my course on a path of further study. I continued to research Ayurvedic techniques for bodyworkers and read texts on Ayurveda written by Dr. Vasant Lad and by Dr. Deepak Chopra. I later trained at Mecca Spa in Austin in the art of offering Shirodhara, an Ayurvedic treatment that involves the warm and consistent flow of aromatic, herbalized oils on the forehead. The word “Shirodhara” is derived from the Sanskrit “shiro,” meaning “head,” and “dhara,” meaning “to flow.” The oils flow over the scalp and through the hair, creating a relaxing and harmonizing feeling throughout the entire body. I loved offering this treatment and always looked forward to sharing this meditative experience with my clients at Mecca. The next opportunity I had to return to the Ayurvedic world was at The Crossing Wellness Spa, a world-class facility in far northwest Austin, Texas, situated on the edge of the Balcones Canyonlands Preserve. The destination spa served the local community as well as guests with 70 guest rooms on the property. The spa featured eleven treatment rooms adjacent to the property’s saline infinity pool that overlooked the serene and scenic Texas hill country landscape. It was at The Crossings that I trained in Ayurvedic techniques with Mark Nasrallah, another of the leading Ayurvedic experts in the U.S. Before becoming the spa director at The Crossings, Mark set up several Panchakarma clinics across the country. I was also fortunate to receive Ayurvedic technique training from David Washburn, a very gifted massage therapy instructor and senior massage therapist at The Crossings who had been practicing massage therapy since 1992 and had participated in over 1,300 hours of basic and advanced massage training. I was very grateful that Mark Nasrallah and David Washburn took time from their busy schedules at the spa to offer me training in a variety of Ayurvedic techniques on top of what I acquired at Murietta Hot Springs and Mecca. Here, I learned the fundamentals of dosha analysis, an Ayurvedic assessment of particular patterns of energy that help determine which treatments would best serve a particular client. I also learned advanced Shirodhara techniques that helped me better serve the specific needs of a client of which I’ve learned to better assess. In addition to the dosha analysis and the advanced Shirodhara training, I was taught Ayurvedic hand and foot massage that can be performed independently of the Shirodhara practice. All in all, it was an amazing educational experience that offered profoundly relaxing and balancing results for my clients. Later I was able to incorporate many of the Ayurvedic treatments that I’d learned over the years in my private practice and I began offering an NCBTMB approved Ayurvedic massage continuing education course through The Ariana Institute. 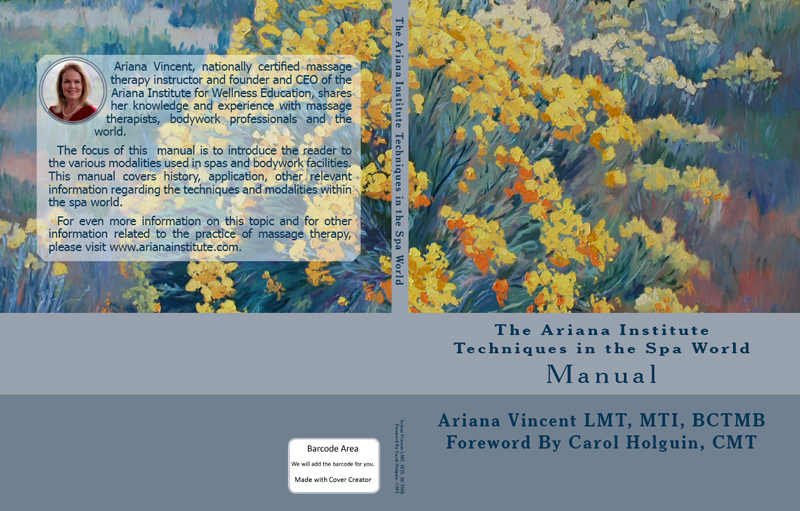 To read the foreword of the Techniques in the Spa World Manual, visit https://www.arianainstitute.com/the-ariana-institute-proudly-presents-techniques-in-the-spa-world-second-edition/. The Ariana Institute for Wellness Education offers an outstanding resource for those interested in deep tissue therapies, featuring topics that include Upper and Lower Body Massage Techniques. The Ariana Institute’s Deep Tissue Massage Therapy Manual is part of a series of massage manuals that are designed to help deepen the knowledge and understanding of current massage therapists and introduce new, upcoming massage therapists to the world of massage and bodywork. To order your copies of the Ariana Institute’s Deep Tissue Massage Therapy Manual visit www.amazon.com/author/arianavincent. 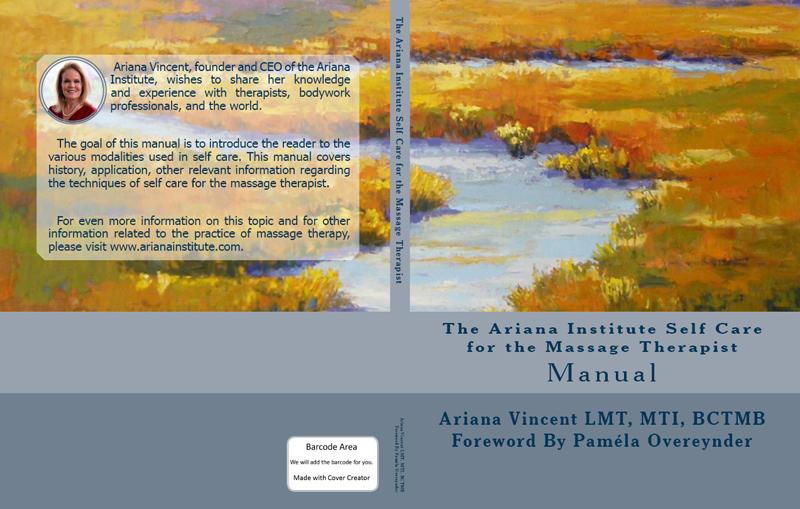 The Ariana Institute’s therapy manual series has been over 16 years in the making and is a monumental achievement for the Ariana Institute. The Deep Tissue Massage Therapy Manual is a perfect source of deep study for massage therapists and those seeking to expand their understanding of deep tissue therapies and further cultivate their practices! Here is the foreword to the Ariana Institute’s Deep Tissue Massage Therapy Manual by David Lauterstein, Co-Director of The Lauterstein-Conway Massage School, MTI, Cert. ZB, Author of The Deep Massage Book. Ariana Vincent’s Deep Tissue Massage Manual is an excellent introduction to deep tissue work. She has gathered many gems of technique and philosophy together. These are drawn from her own extensive experience and knowledge of deep tissue from her own practice extending over 30+ years. She has graciously included in this manual useful collaborative insights from other excellent teachers and writers – Art Riggs, Ryan Hoyme, Michael Carpenter and others. She does an excellent job detailing the proper body mechanics for performing deep tissue work. So often therapists hurt themselves trying too hard or utilizing less than optimum posture and movements. Her emphasis and information on body mechanics is to be applauded. Ariana is not only a pioneer in massage and instruction, she has provided a great number of on-line resources and courses through the Ariana Institute. At the same time, she also does the field a service by emphasizing, in addition to her contribution to the growing literature on deep tissue, that it is best if students receive hands-on instruction in deep tissue massage therapy. Throughout the manual, added to her important verbal explanations of the techniques, she has, for visual learners, included some excellent photos and links to her videos illustrating this work. This manual is a superb compendium of deep tissue techniques that can be adapted to serve the many needs of a client during a session. She recognizes that of course pieces of this may be included or edited out depending on the client’s needs, preferences, and the length of the session. 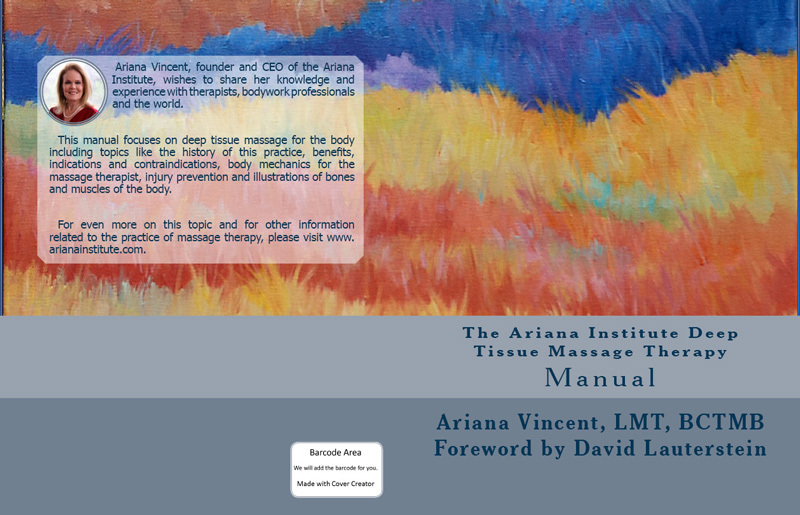 The Ariana Institute’s Deep Tissue Therapy Massage Manual will be helpful to everyone who reads it! The Ariana Institute’s video introduction to the Deep Tissue CE courses can be accessed below or on the Ariana Institute’s YouTube Channel at www.youtube.com/user/ArianaInstitute. To order your copies of the Ariana Institute’s Deep Tissue Massage Therapy Manual visit www.amazon.com/author/arianavincent. The Ariana Institute for Wellness Education offers an outstanding resource for those interested in further developing their massage therapy practices, featuring topics that include Marketing, Practice Building, and Ethics for massage therapists. The Ariana Institute’s Marketing and Practice Building for Massage Therapists Manual is part of a series of massage manuals that are designed to help deepen the knowledge and understanding of current massage therapists and introduce new, upcoming massage therapists to the world of massage and bodywork. To order your copies of the Ariana Institute’s Marketing and Practice Building for Massage Therapists Manual visit www.amazon.com/author/arianavincent. This manual incorporates comprehensive resources to encourage a thorough understanding of professionalism, marketing, and business strategies for the massage therapist. The Ariana Institute’s therapy manual series has been over 16 years in the making and is a monumental achievement for the Ariana Institute. The Marketing and Practice Building for Massage Therapists Manual is a perfect source of insight and inspiration for massage therapists and those seeking deepen their understanding in order to build and sustain a career in massage therapy and bodywork! Here is the foreword to the Ariana Institute’s Marketing and Practice Building for Massage Therapists Manual by Shelli Davis-Redford, LMT, MTI. The business of massage can be a challenging and unchartered path for many a massage therapist. Many of us became a therapist out of a desire to help people and change our client’s lives. In the near 20 years that I have been practicing as a licensed massage therapist, massage therapy instructor, and CE provider; I have discovered that most therapists spend their entire career helping others and failing their own selves. With limited business training and huge excitement of the journey ahead, most new therapists embark on a path they never believed they would end up failing at. I have spent many years mentoring therapists through my work with the schools I taught at, my own thriving practice, and through the organizations I have been a part of; including AMTA, ABMP, and TAMT. Not once did I meet a therapist that said they never wanted to make it as a therapist. Not once did I hear a therapist say, “I plan to quit and give up in a year or two.” Sadly though, this has become the norm. I was so excited to see Ariana’s Marketing and Practice Building Manual. As an educator of business and marketing classes for massage therapists, it was a significant honor for me to be able to review this incredible resource designed to reach out to our industry and enable not only new students, but also more seasoned therapists and guide them successfully on their desires for a professional foundation for achievement. With more than 30 years’ experience in the massage industry, Ariana has crafted one of her finest resources yet. This manual provides an individual with the necessary guidelines to build and sustain a thriving practice based on healthy professional boundaries and a strong ethical approach. Learn to visualize your future by setting your dreams to goals and making your goals a reality with this step-by-step manual for success. Focus on core concepts; including knowing how to not just work your business as a therapist, but also as a business manager, networking engineer, marketing guru, and social media savvy socialite. Master “Call Me” ads and draw your clients back to you. Rediscover your “24-Karat Gold Mine” and gain a strong working knowledge of the rules, laws and regulations that govern us as an industry. Utilizing this guide will strengthen and diversify your business as well as your income potential. You will learn how to assess where you are and make your plans for where you desire to be. Ariana provides detailed key components to enhance your business strategies and additionally provides foundational elements to create, establish and continue to grow your business upon. Feeling lost in the industry? Lost your way, but just not ready to give in and give up? Today is the first day of the rest of your incredibly amazing new future, your guided path along an enlightened journey to professional victory. Use this manual as your new hope and Ariana as your guide. The Ariana Institute’s video introduction to the Ethics, Marketing and Practice Building CE courses can be accessed below or on the Ariana Institute’s YouTube Channel at www.youtube.com/user/ArianaInstitute. To order your copies of the Ariana Institute’s Marketing and Practice Building for Massage Therapists Manual visit www.amazon.com/author/arianavincent.